The weather in January through March generally is favorable to planting bare root trees. Bare root stock is grown in a field and, therefore, has better root health and spread than those that are container-grown. However, it is important to inspect the bare roots as it is possible to experience root loss when it is dug up for sale. To ensure good anchorage, avoid bare root trees that are one-sided or that have roots crossing over one another. Detailed guidance on selecting bare root trees can be found in “An Apple a Day” by SCMG Joe Michelak. BEFORE YOU PLANT, you can test drainage by digging a planting hole and filling up the hole with water overnight. Fill up the hole again the next day. If the water drains over the second night, the drainage is satisfactory. If the hole is still full, solve the drainage problems or relocate your tree before planting in order to avoid anaerobic conditions. When bringing in large amounts of topsoil to re-landscape, avoid the common problem of the root crown settling below the soil which will cause the tree to suffer rot/disease. Most root development occurs laterally. If your soil has major limitations, you may have to cultivate the soil by digging a wider hole than usual. PROPER WATERING is essential for aftercare of a newly planted tree. Keep drip emitters three feet away from the trunk or build a berm and basin around the tree and fill it with water. Keep vegetation, especially weeds, away; they retard tree development. Do not place mulch next to the trunk. STAKING is a controversial issue. The purposes of a stake are to support, anchor, protect and straighten the tree. The selection of a good specimen may preclude the need for staking. Obviously, your environment will influence your decision. For example, heavy winds or land slope may require staking. 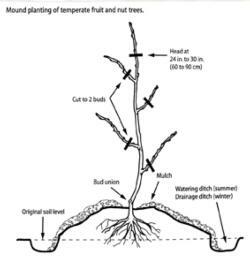 The classic method is to place two stakes outside the root ball and use nonabrasive ties to gently secure the tree to the stake at the lowest height possible - so that it comes back to an upright position when slightly and gently bent. Allowing the tree this flexibility will encourage tissue growth which results in trunk strength/girth. If this doesn’t make sense to you think about the atrophy humans experience when a limb is in a cast for a long time. If used, stakes should be removed within one year. PRUNING’s purpose is to develop structure and form. In fruit trees, fruiting viability is increased with proper pruning. 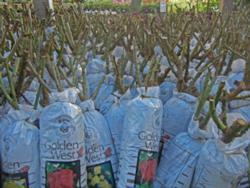 Well-pruned trees have better structure, are less costly to maintain and live longer. Pruning approaches are different for young trees where the primary consideration is its future strength and integrity. Hopefully, the careful selection of your specimen means you have no structural defects to immediately correct. 1. Remove broken, dead, dying, diseased or damaged branches. 2. Select and establish a central leader (better: purchase a tree with a central leader). 3. Select and establish the lowest permanent branch. 4. Select and establish scaffolding branches. 5. Select temporary branches, below the lowest branch. This allows for more photosynthesis which encourages better trunk taper and growth.